From July 18 to 24, together with Piano Technicians Association in Moscow we organized two technical seminars for service technicians. First of these took place in hall of Piano Technicians Association in Moscow with a topic of “Regulation, intonation and tuning of the concert grand piano AP 275“. The training was held by Jaroslav Horyna, one of the best voicers in PETROF and attended by technicians from Moscow and Kazakhstan. Second, more technical part took place in Bryansk (a city of around half a million inhabitants, halfway between Moscow and Belarus). 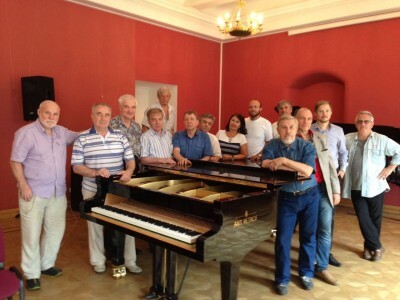 In first part of this seminar, Russian group repaired an old piano P IV and then, together with Jaroslav Horyna, regulation and intonation was prepared and carried out. 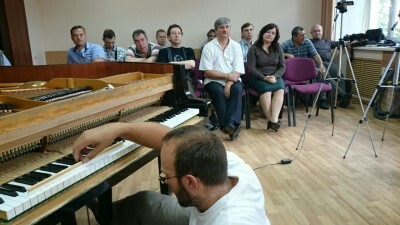 The seminar enjoyed a significant attention of local media and municipal government, and it was concluded with a concert performed on the fixed piano.